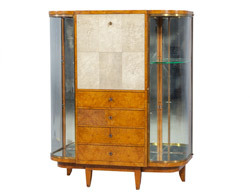 Whether you’re looking for an overstuffed sofa, a beautifully shaped display cabinet, or a luxurious piece to make a statement in your home, art deco is an excellent style choice. Here, we will dive into the history of art deco as well as learn what makes the style unique. Art deco is a style that became popular in the 1920s and 1930s in Paris due to an art exhibition. This style spread universally and was used in art, architecture, fashion, and décor. 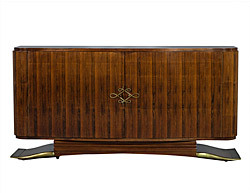 Art deco celebrated modern life and emphasized luxury and sophistication. Features material such as chrome, plastic, plate glass, and luxurious materials such as ivory, mahogany, and dark lacquer. Often lacquered to create shiny surfaces. Common design elements include zigzags, chevrons, and geometric elements. Emphasis on vertical lines and smooth surfaces, often using bold colours. Some pieces used hard woods such as ebony or Macassar and featured veneers while others featured modern materials with high contrast. 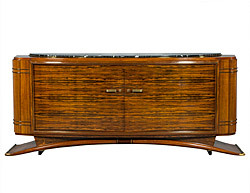 Carrocel has a variety of art deco furniture pieces for many rooms in your home. Visit our 20,000 square foot showroom, located at 245 Bridgeland Avenue in central Toronto, and you’ll be sure to find a piece that inspires you. For a more in-depth selection, please view our online catalogue.